Kandisky Trio 2016-2017 Brochure, with full performance descriptions. Sunday, April 30, 2017. 3:00 p.m.
Saturday, September 3, 2016. 7:30 p.m. The program opens with Haydn’s witty Trio Hob. XV: 11 in E-flat, to be followed by Mozart’s sublime Oboe Quartet. Saturday, September 10, 2016. 7:30 p.m. Guests are Kimberly Fedenburgh viola and Kevin Vigneau, oboe. Music of Haydn, Mozart, Loeffler and Britten. Saturday, November 5, 2016. 7:30 p.m.
$20-45 general public, $10 for students and youth 18 and under. The performance will be held in the Anne and Ellen Fife Theatre, located within the Moss Arts Center’s Street and Davis Performance Hall at 190 Alumni Mall. The Moss Arts Center welcomes local favorite the Kandinsky Trio, along with jazz greats Kurt Rosenwinkel and Paul Langosch, for a performance that includes a mix of classical and jazz sounds. Friday, November 11, 2016. 9:40 am. Saturday, December 3, 2016. 7:30 p.m.
One of Beethoven’s first published works in 1795 was a set of piano trios, which established him as a bright and powerful voice in Vienna. Mozart’s sunny Trio in B-flat Major opens the program. Saturday, January 21, 2017. 7:30 p.m. This concert is part of the Martin Luther Year Celebration at Roanoke College that will highlight the musicological and philosophical connections between Johann Sebastian Bach and Gottfried Leibniz. Saturday, March 18, 2017. 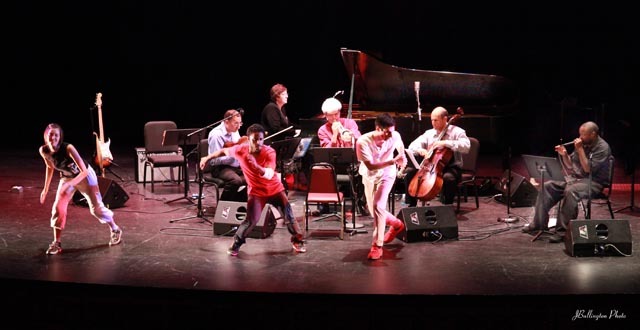 7:30 p.m.
Two works will be performed that touch on the human condition. Tuesday, Dec. 1, 2015. 11:00 a.m.
Lecture/demonstration “Degenerate Art, in Relationship to the Nazi Regime”. Free Admission. Saturday, December 5, 2015. 7:30 p.m.
Olin Theater, Roanoke College, Salem, VA.
“Contentment and Tragedy” Trios by Mozart, Smetana, Dan Cavanagh and Robert Pannell. Saturday, January 23, 2016. 7:30 p.m.
“A Trio, Quartet and Quintet” with guest artists, Evelyn Grau, viola and Teresa Ling, violin. Dvorak’s “Terzetto” trio, Mozart’s String Quartet in C Major and the Schumann Piano Quintet. Friday, February 5, 2016. 8:00 p.m.
Trios of Mozart, Smetana and Dan Cavanagh. Saturday, September 20, 2014. 7:30 p.m.
To start off their 27th year, the Kandinskys will team up with Opera Roanoke Director and tenor Scott Williamson, violinist Nicole Paglialonga and violist Alistair Leon Kok to perform the poignant, lyrical setting of “On Wenlock Edge” by Ralph Vaughan Williams. Haydn’s E Flat Major Trio and Dvorak’s Trio in F Minor, a work that shows the composer in full command of his great artistry, will also be performed. Wednesday, November 5, 7:45 p.m.
Thursday, November 6, 7:30 p.m.
Trio in E-flat Major, Haydn, 4 Pieces for 3 Instruments, Cowell and Trio in G Minor, Chausson. Thursday, November 13, 2:00 p.m.
Lecture/demonstration “Russian Music: Folk, Under the Czar and Stalin”. Trios of Tchaikovsky and Shostakovich. Monday, November 24, 9:30 a.m.
Lecture/demonstration “Musical Trends Through the World Wars”. Trios of Cowell, Turina and Shostakovich. Monday, November 24, 12:00 p.m.
Lecture/demonstration “Art and the Holocaust”, Trio in E Minor, Shostakovich. Saturday, December 6, 2014. 7:30 p.m.
Olin Theater, Roanoke College, Salem, VA. Ernest Chausson died young but he left behind some significant and beautiful works. His Trio in G Minor is a great example of his use of rich sonority and hyper-romantic writing. Opening the concert will be Beethoven’s early Trio in G Major, a work of great verve and wit followed by Henry Cowell’s evocative Four Combinations for Three Instruments from 1924. Saturday, January 24, 2015. 10:00 a.m.
Violinist Hal Grossman, prize winner of awards such as the International Stulberg Competition, National Fischoff Chamber Music Competition and the International Cleveland Quartet Competition will join the Kandinskys along with Esme Allen-Creighton, violist of the renown Serafin String Quartet for Prokofiev’s Sonata for Two Violins and one of Shostakovich’s most beloved works, his Piano Quintet in G Minor. Mozart’s charming Trio in G Major will begin the concert. Music of Haydn, “Jacob’s Dream”, Danielpor “The Desert Wanderer” and Dvorak, “Dumky” Trio. Saturday, March 21, 7:30 p.m.
Music of Haydn, “Jacob’s Dream”, Mozart Trio in G Major and Beethoven, Trio in G Major. Olin Recital Hall, Roanoke College, Salem, VA.
“Music of the Enlightenment”, leture demonstration featuring works by J.S. Bach, Haydn and Beethoven. Haydn Trio in C Major, Ravel Trio in A Minor, new works by Cavanagh “Burst”, Hehmsoth “Three Shades of Blue” and featuring the premiere of Richard Danielpour’s “The Desert Wanderer”. Squires Recital Salon, Virginia Tech, Blacksburg, VA.
Haydn Trio in C Major, Ravel Trio in A Minor, works by Cavanagh, Hehmsoth, Danielpour, “The Desert Wanderer” and Danielpour “The Desert Wanderer” and “As Night Falls on Barjeantane”. Richard Danielpour will give a public master class before the concert for Virginia Tech student composers at 1 p.m. in the Squires Recital Salon. Garth Newel Music Center, Herter Hall, Warm Springs, VA.
With Teressa Ling, violin and Evelyn Grau, viola. Garth Newel Music Center, Warm Springs, VA.
Saturday, March 15, 2014. 7:30 p.m.
Olin Theater, Roanoke College, Salem, VA. 7:30 p.m.
Haydn’s Trio in A-flat Major and Beethoven’s Opus 70, No. 2 will bookend 3 works that are part of the 25 X 25 Project. Todd Reynolds “Mating in Captivity”, Ivica Ico Bukvic “Dust” for Trio and Computer, and Dwight Bigler “Thoughts and Dialogues” will be the featured commissioned works. Wednesday, March 12, 2014. 2:00 p.m. and Thursday, March 13, 2014. 2:30 p.m.
“Trends of Romanticism” lecture demonstration featuring music by Beethoven, Dvorak and Chopin. Tuesday, March 18, 2014. 10:00 a.m.
“Art Music is a Necessary Vice” lecture demonstration featuring music of Haydn, Beethoven and Todd Reynolds. Friday, April 11, 2014. 9:30 a.m.
“The Holocaust Effect on Art” lecture demonstration featuring music of Shostakovich and Romanian and Hungarian Folk songs. Master class and residency, Boise State University, Boise, Idaho. Saturday, March 9. 7:30 p.m.
Caldwell Fine Arts Series, The College of Idaho, Caldwell, Idaho. Jewett Auditorium with guests Linda Kline Lamar, viola and Craig Purdy, Violin (Les Bois Chamber Players). Beethoven Trio, Opus 1, #3, Hilary Tann “…slate, blue-grey” and “Nothing Forgotten” followed by the Franck Piano Quintet. Sunday, March 10. 6:00 p.m.
McCall Music Society, Congregational Church, McCall, Idaho. Beethoven Trio, Opus 1, #3, Hilary Tann “…slate, blue-grey” and “Nothing Forgotten” followed by the Shostakovich Trio in E Minor. Kandinsky Trio Series, Olin Hall, Roanoke College, Salem, VA. Haydn Trio in F Major, new works by John D’earth, Graham Waterhouse and Russell Riepe followed by the Shostakovich Trio in E Minor. Common Experience and Guest Artist Series. Texas State University, Evans Auditorium, San Marcos, Texas. Music by Riepe, Tann, Jones and Hehmsoth. Wednesday, April 17, 12:00 p.m.
Austin Community College, Northridge Campus, Austin, Texas. Music of Riepe, Jones and Shostakovich. The Kandinsky Trio is currently in residence at Roanoke College. Saturday, September 15, 7:30 p.m.
Silver Anniversary Opening Concert Music of Beethoven, Holliday, Mauthe, Smirnov, and Brahms Trio in B Major. Champagne Concert Music of Mozart, Shatin, Grier, Jones and the Faure Piano Quartet in C Minor with guest violist Hillary Herndon. Thursday, February 21, 3:00 p.m.
Olin Recital Hall. Roanoke College, Salem, VA. Music and the Enlightenment. Lecture demonstration. Music of Haydn, Mozart and Beethoven. Outstanding Works, Known and Unknown. 7:30 p.m.
An evening of piano trio gems will feature Mendelssohn’s glorious Trio in C Minor, Opus 66. “Nothing Forgotten” by the Welsh composer Hilary Tan will also be showcased. Starting the program will be Mozart’s Trio in G Major, K.496. Beethoven, Bartok and Chausson. 7:30 p.m.
Residency made possible by a grant from the Carpenter Foundation. Workshops and performance. Richmond Center Stage. University of Richmond 7:30 p.m.
Roanoke College, Olin Recital Hall, 12 pm. April 16, 2011 – with “Les Bois Chamber Players”, Franck Piano Quintet.